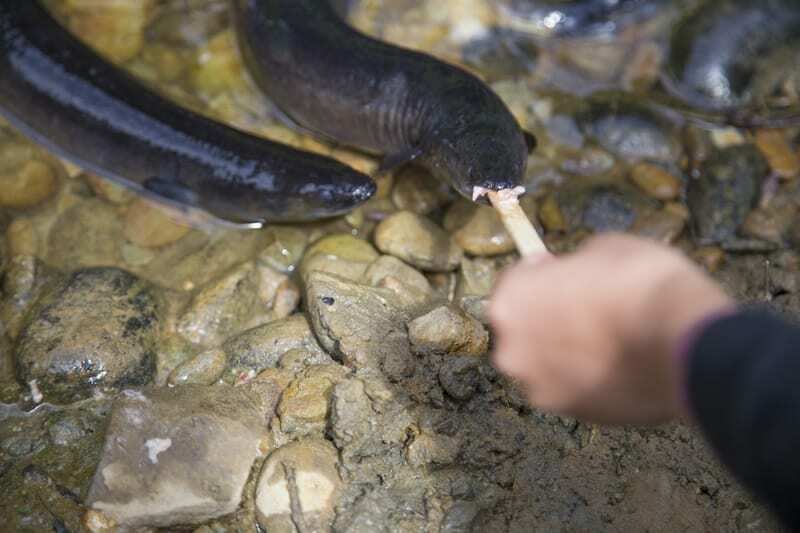 It is fascinating to have the opportunity to see these endangered native eels in their natural habitat, and to be able to feed them by hand. The Tasman stream, which runs along the front of the Jester House property, is the natural habitat of the New Zealand long finned eel – Ngā Tuna. Every day from September until May the tame eels are in the creek and hungry to be fed. This is your chance to get up close and personal to these amazing native megafauna! The fun you have feeding eels at Jester House is fundamental to the success of the species because feeding the eels helps them to get into peak condition for their long and mysterious 8000km journey to the breeding grounds on the Tongan shelf. The more eels that make it means more baby eels, ensuring that a good number return to the Tasman Stream and continue their life cycle. New Zealand long-fin eel numbers are in critical decline due to habitat destruction and over fishing. By feeding the eels you are directly helping the survival of this amazing native species. However… please do not feed them any old food, or over feed them. We sell special food that is suitable to their diet, and will limit the amount sold each day. As with humans, eating the wrong foods, or too much food, is not good for their health.